At the beginning of the summer I was complaining about my lack of asparagus, and blamed it on lack of water. My super smart SIL was like, “you could put in a water feature, and where the water splashed out, that would provide moisture for the asparagus” and I was like, “yeah, I guess that would work, but…wait, I have a water feature!” Okay, the water feature is a horse trough, aka the Hillbilly Goldfish Pond,what would happen if I moved some asparagus plants over to it? 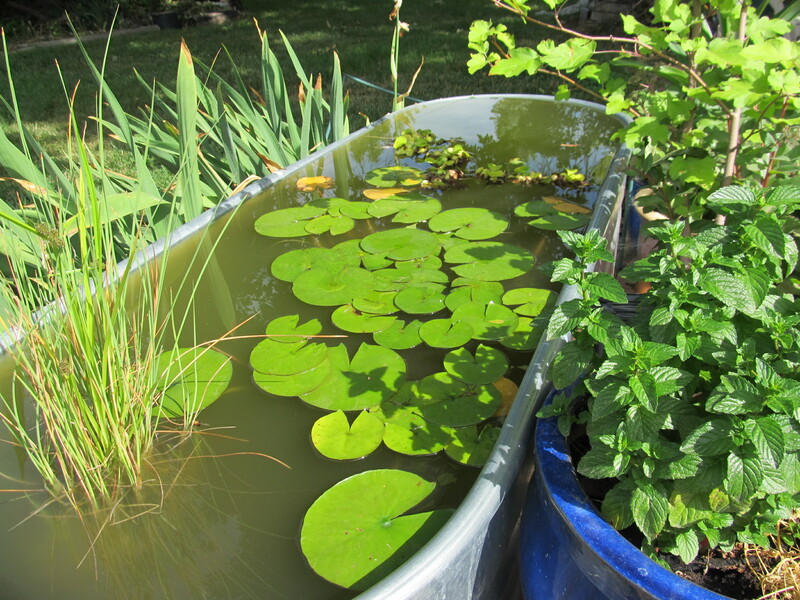 When I first set up the pond, I tamped down the soil to make it level, but over the couple of years of its existence , it has slumped down on the north side, so that is where I dug the hole. I don’t have a fountain, but when I refill it, it trickles over the side on that end. I dug down about 8 inches, added some compost, then transplanted an asparagus plant over from where they don’t get enough water. A hole in the yard is not exactly the look I am going for, but I have high hopes for next year. As it grew, the plan was to add more compost, until the plant and the soil were at ground level. 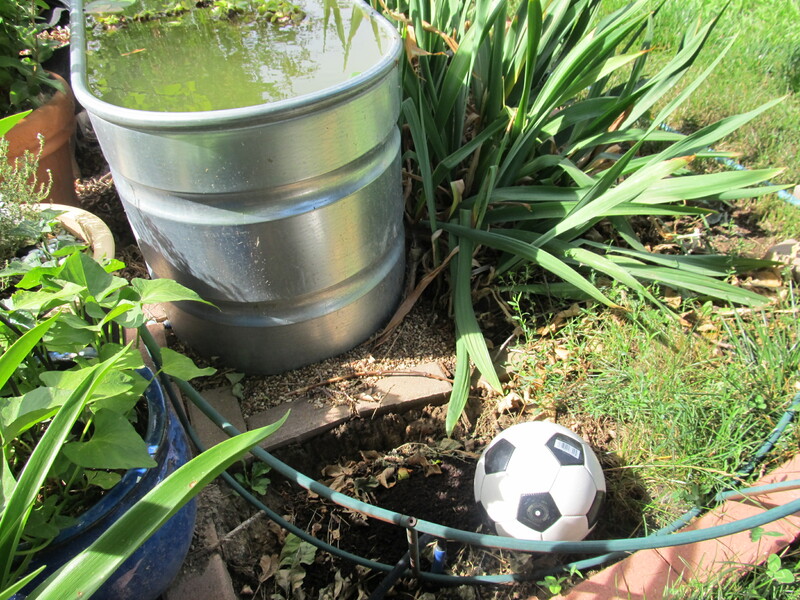 I watered the little baby asparagus the same way I water the containers around the pond- just before I feed the goldfish, I use a cup to dump water on each of the plants- they love the “nutrient rich” water. This worked great for a few weeks, then we went out of town, and I came back to nothing. There wasn’t a dried up stem, it was just gone. I might blame rabbits, or squirrels, but the other asparagus plants, the ones that don’t get enough water? They are fine. Other than the fact that they don’t get enough water. So, I put a little fence around the hole in the ground, and I will try again next year. I am convinced that the idea of putting asparagus near a water feature is a good one. Just try not to step in the hole, please.